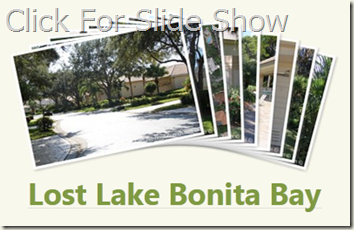 Lost Lake at Bonita Bay is a single family villa home community located in the gated community of Bonita Bay. Homes in Lost Lake range in size from about 1,870 SF to about 2,800 SF of living space. All homes have a minimum of two bedroom and up to three bedrooms. Lost Lake consists of only one street, Lost Lake Lane. Lost Lake was constructed from 1992 to 1996. The community is built out and there are only resale homes available. There are only twenty-six single family homes at Lost Lake. Since there are usually few homes for sale in Lost Lake at Bonita Bay similar housing options may be found at Montara at Bonita Bay and Enclave at Bonita Bay. The views from the lanais of homes in Lost Lake at Bonita Bay are mostly nature preserve views. A hand full of homes have lake views or community swimming pool views. Individual homes at Lost Lake may have a private swimming pool or private spa. Homes without a private pool can use the community swimming pool at Lost Lake, which is available for Lost Lake residents only. The walking paths of Bonita Bay run along side of Lost Lake and they are just one of many great amenities that homeowners at Lost Lake have access to. Other Bonita Bay amenities include three interior parks, canoe parks, fishing pier, playgrounds, butterfly gardens, boat ramp, tennis courts and a community beach park on Hickory Boulevard. Bonita Bay also offers a community shuttle service to the beach park. Only Bonita Bay home owners may access the beach park and shuttle service. Additionally, there are many optional memberships available such as a house membership (clubhouse), sports and fitness membership, golf equity membership and marina membership. To learn more about the amenities, read also: Bonita Bay Golf and Country Club. Contact Chris today to learn more about Lost Lake at Bonita Bay and Bonita Bay Real estate.